Ladies, we all know how annoying that time of the month can be! At best, “Aunt Flo” is an annoyance but for many it means cramps that will make you stay in bed the entire time. Nobody wants that. We, women are busy people! We’ve got things to do, little ones to take care of, places to go! Now the usual approach to dealing with menstrual cramps is taking painkillers like they are candy (well hopefully not that often but you get the idea!) Some women even get on birth control just for less painful periods. Personally, I like to keep things natural. Painkillers do not seem too risky because we’ve all grown up using them and everyone uses them all the time but there are reasons why you should avoid them unless absolutely needed. Birth control is even more risky but of course it doesn’t seem like it because our society has made birth control very common. Whether it’s painkillers or birth control, both of these options synthetically mess with our bodies natural way of living. There are actually quite a few ways that you can improve cramps in a natural method that will work with your body. This post is obviously going to feature my menstrual cramp relief tea which is amazing! So many friends have tried it and say it works wonders for them and so now I’m passing it on to all of you! However before moving on to my menstrual cramp relief tea, I want to talk about the ways that we can reduce cramps in a non-treatment sense. Switching to natural feminine care products like menstrual cups and cloth pads can reduce cramps! I know it sounds far fetched but it’s really true! Ok, so this tip is kind of the point of this whole post… tea remedies. A main ingredient in my menstrual cramp relief tea is red raspberry leaf! However, that tea blend is really just for a few days prior and during your period. During all those other days of your cycle, if you drink red raspberry leaf tea on it’s own, it can help tone your uterus so that it’s in better shape when you do get your period! Avoiding caffeine, sugar, and estrogen mimicking foods like soy, while consuming healthy fats like coconut oil and avocados can help reduce your cramps. Did you know that most of use are deficient in magnesium? Magnesium can help reduce cramps so eating plant of magnesium rich foods can help you have an easier period… and a healthier body overall. Applying magnesium oil or taking cell salts #8 are other supplemental ways to get more magnesium. Yes, I know… during that time of the month we do not want to move around. I don’t know about you but I’d much rather lounge on the couch all day long with a pint of ice cream. However, exercising at least a few times a week helps reduce cramps naturally just by getting more blood to your muscles. Yoga can be especially helpful as you can take it gently and there are even specific moves that can help ease cramps! I’ve got a cramp relief salve that works wonders on cramps. It’s pretty easy to make and should last a good year. Definitely something worth making and having on hand! 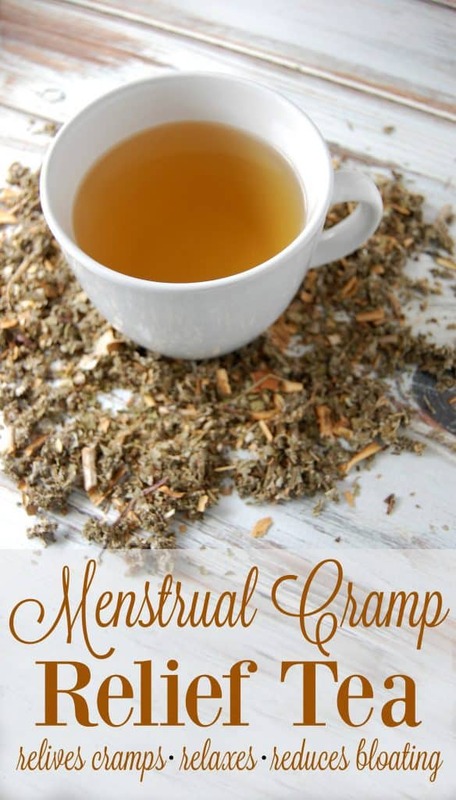 What Makes This Menstrual Cramp Relief Tea so Amazing? As I mentioned above, red raspberry leaf is the herb for uterine toning and thus red raspberry leaf is great for menstrual cramps! Red raspberry leaf regulates menstrual cycles, can decrease heavy cycles, and helps with PMS! It’s also full of calcium, iron, magnesium, vitamin A, vitamin C, vitamin E, and B vitamins! Dandelion leaf is a great herb to add during your period (although I love it all month long!) It’s high in iron, vitamin K, vitamin A, calcium, and potassium which makes it great for those anemia dips you might get during that time of the month as well as water retention! The name cramp bark should be pretty self explanatory. It’s a bark that’s great for cramps! 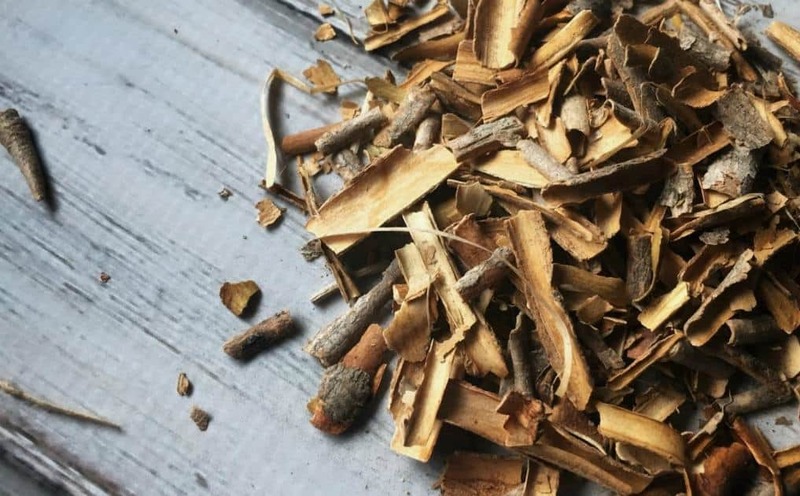 It’s an antispasmotic herb that obviously helps with cramps but can also help with bloating too! It works best if you start taking it 1-2 days before cramping which is a good reason to get familiar with your cycle! The menthol in peppermint acts as an antispasmodic which means it’s great for relieving menstrual cramps! It’s also included in this tea blend to help relaxation and help make this tea taste yummy! Mix all ingredients and store in jar. Single Cup – Add 1 tablespoon of tea blend into 8oz of just under boiling water. Steep for at least 10 minutes. Strain, sweeten if desired, and drink. Large Batch – Bring 10 cups of water to just under a boil. Add entire amount of nursing support tea blend. Steep at least 10-20 minutes or overnight. Strain and store tea in refrigerator. 1-2 days prior to your period, beginning drinking 1-2 cups of tea. During your period, drink as often as you feel it’s needed. Note: If you are nursing, you should probably leave out the peppermint! Peppermint can reduce your milk supply. 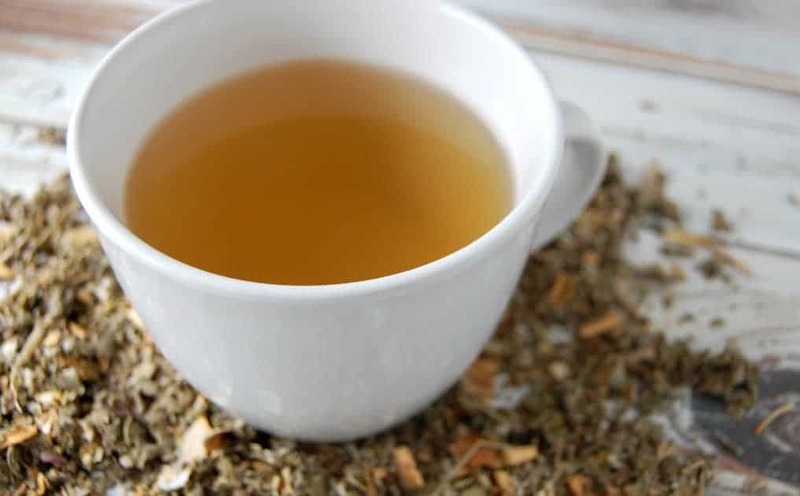 Usually you would need a good deal of peppermint tea to reduce your supply but your supply can already dip during your period and if you need to sip a few cups of this tea daily for your cramps, you wouldn’t want to risk messing your supply up. You can sub in ground cinnamon and/or ground ginger (roughly 1/2 teaspoon each per the recipe above).